-Take the fellas out to fish the Columbia River for some Sturgeon...They're huge and disgusting...but I'm told very fun to catch. -Get in the team bus and go drive through the gorge...it's truly breath-taking. -Go get a "Burger Smash" at Mui Mui's in the Pearl District...and the coaches should definitely go out for a pint at McMenamin's...the food's not too good, but all of these joints have a weird, artsy decor and a lot of good beers. -Take the 45 minute drive to Nike in Beaverton...it'll either make you love the brand or hate 'em even more...But it's worth seeing. Alright, alright, I'm just kidding- it's a business trip...Matty, handle your business, win two games and get back to God's country. But on your way out of town, grab a pretzel at Gustav's in the Airport...can't go wrong there. Terry Hutchens from the IU Star liked the Boilers in the BT tourney...and he was right. 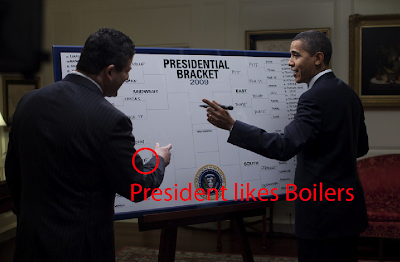 Now, the leader of the free world thinks our Boilers are getting at least to the round of 16 to play UConn...He's a pretty big college fan, so I guess that's not a bad thing. Nevermind the economy...get your bracket filled, Barry! Purdue also seems to be the trendy pick by the braintrust of ESPN to be the #5 that can kick the most arse and jot down a few names, in the process...While they're absolutely correct, let's hope the young men based out of West Lafayette aren't believing whats on the Center. If UND wins in the NIT and no one's there to hear it, does it make a sound? In the always-interesting NIT last night, some teams lost and some others won. Talor Battle's heroics kept the kitties hopes for number 66 alive...Steve Curry shot like he used to in the important tournament...and 15 domers came out to watch UND face Mike Davis' Blazers. EsPN told us how great the Irish fanbase was back in January...and they are still right! Their core fanbase of 5-or-6 is as good as any in the nation!! 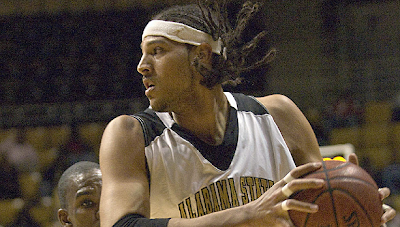 Sadly, the Chief will not be playing any more games in the NCAA tournament. There will be no Kickingcardinalassims for 'Bama State. Something for you to think about, and hatchet your bracket up with before the real dance begins- There are a few teams who drastically underachieved this season, but still might be able to make some noise in the field of 64. All of these squads are chocked-full of talent...and all seemed to be motivationally-deficient, at least during stretches of the regular season. Perhaps the big stage, bright lights, and feeling of imminent doom will motivate these four to play to their potential...or, maybe they'll continue to not reach their potential and their coaches will continue stealing money. The 12-5 matchup is historically filled with upsets...but this year, it seems the 11-6 games might yield an upset or two, methinks. Also, I think a 2 or 3 seed will fall in the first two days of the tourney...Just seems like we're due for a shocker like that. Mar 18 Join the 200+ others!